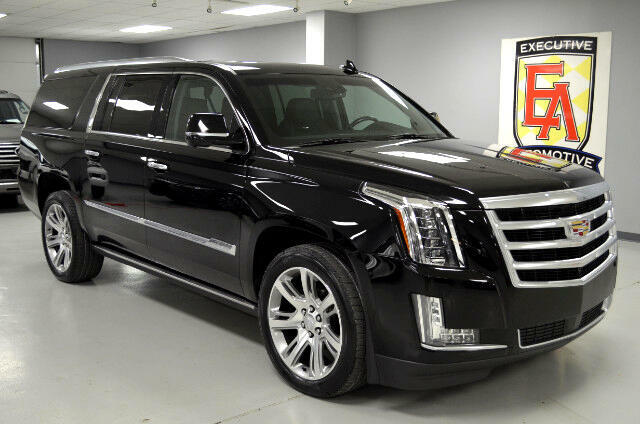 2015 Cadillac Escalade ESV 4X4 Premium in Black Raven with Jet Black Leather ONLY 17K MILES Options Include: NAVIGATION, BLUETOOTH FOR PHONE AND AUDIO, HEAD-UP DISPLAY, KEYLESS PUSH BUTTON START, REAR SEAT ENTERTAINMENT SYSTEM, TRI ZONE CLIMATE CONTROL, POWER GLASS MOONROOF, 22 INCH DUAL 7 SPOKE ULTRA BRIGHT FINISH ALUMINUM WHEELS, POWER RETRACTABLE ASSIST STEP, SIDE BLIND ZONE ALERT, REAR CROSS TRAFFIC ALERT, DRIVER AWARENESS PACKAGE, DRIVER ASSIST PACKAGE, SURROUND VISION, HANDS FREE POWER LIFTGATE, HEATED STEERING WHEEL, HEATED AND COOLED FRONT SEATS, WIRELESS CHARGING, SIRIUS XM RADIO, 16 SPEAKER BOSE AUDIO, TOW PACKAGE. Contact Kyle Porter at 816-616-2500 or email kyle@executiveautomotive.com for additional information. Thanks for your interest in our Cadillac!